There are fears that Holland’s notorious "motorway marksman" may have struck again after a driver had his windscreen smashed on the A4 near Rotterdam. Since early August police have received nearly 50 reports of windscreens being smashed on main roads across the country, particularly in west and central regions. The public prosecutor’s office (OM) has put up a €10,000 reward for information that helps catch the gunman, but police have been frustrated by a lack of hard evidence. 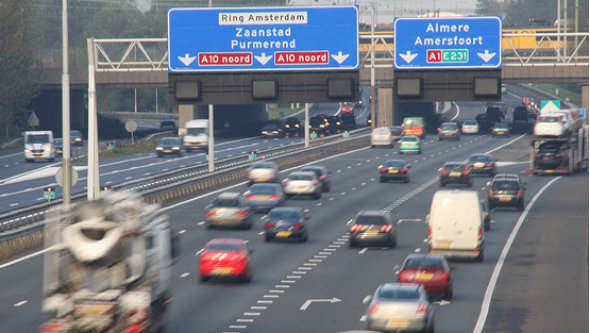 The first reports date back to August 8, when seven motorists on the A13 between Rotterdam and The Hague reported their windows had been smashed. Another four victims were traced through repair garages. So far nobody has been killed or injured in the incidents. Witnesses have given conflicting reports about the marksman's methods. He is believed to use an air rifle and appears to be most active between Friday evening and Monday morning. Some victims he fires from the verge, others claim to have been attacked from another car. Last week police appeared to have a breakthrough when a victim gave a description of the gunman's car - a grey Volkswagen Golf. Corine de Ruiter, senior lecturer in forensic psychology at the University of Maastricht, told De Volkskrant that the shooter was playing a ‘cat and mouse’ game with police. She said: “The fact is he’s committing vandalism, although there is always the associated risk of somebody being killed. Then two weeks ago came perhaps the biggest bombshell of all, when security and justice minister Ivo Opstelten admitted that the “motorway marksman” may not even exist. After visiting the investigation team at the National Police Corps (KLPD) headquarters in Waddinxveen, Opstelten said that despite receiving more than 500 calls from the public, police had not been able to compile a profile of the shooter. The KLPD has not ruled out the possibility that the windscreens may have been damaged by other means. “We are putting every effort into the investigation. I am assured of that,” Opstelten added. As the mystery deepens, the reports keep streaming in. Last Friday windscreens were smashed on the A12 near Almere and the A6 at Bodegraven. Police sent out a helicopter and dog teams to try to catch the gunman, but once again found no trace.